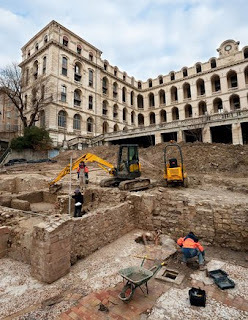 Archaeological research at the Hotel-Dieu in Marseilles, France has uncovered the remains of a medieval church and a floor dating back to the Roman period. It is believed that this was the Church of the Holy Spirit, which was demolished in the 19th century. The building measures 9 feet wide and 28 meters long, and has several side chapels, for total area of 300 square meters. The discovery includes a floor in the church's crypt, dating back to the Roman period. The floor contains large irregular stone that come in the colours white, black, yellow and red. The floor was used during the Middle Ages and early modern times. 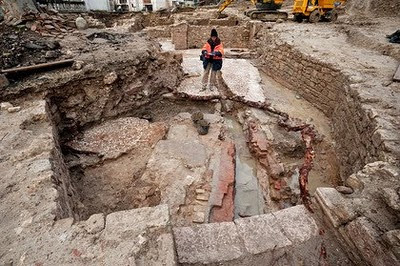 The archaeologists also found evidence that suggests the church was redesigned in the 17th century. The Hotel-Dieu started out as a hospital created by the Brotherhood of Saint Spirit, an important local organization, in the 12th century. The hospital underwent several rebuilds and renovations, with the present building be built in the 18th century. Gardens were created around the site in the 19th century, which involved demolishing several surrounding structures, including the church. The Hotel-Dieu is now being converted into a luxury hotel.